1. 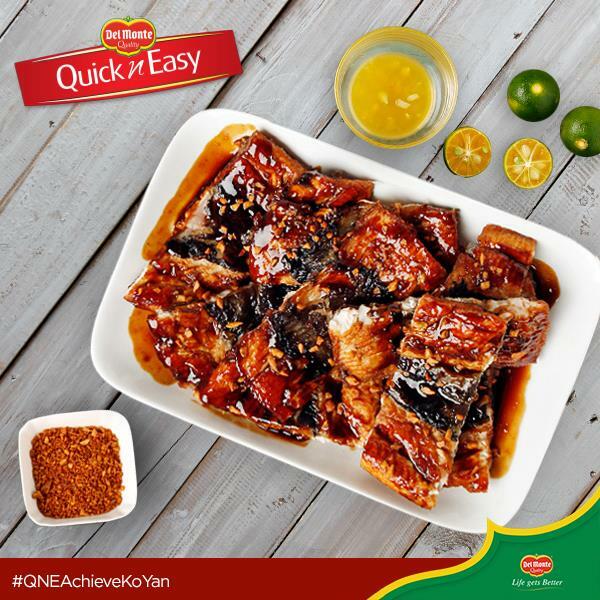 Marinate bangus in calamansi juice, reserved pineapple syrup, Del Monte Quick ‘n Easy BBQ Marinade for 20 minutes in the refrigerator. Drain, then reserve marinade. 2. Sprinkle bangus with cornstarch. Fry till golden brown. Set aside. 3. Simmer remaining marinade uncovered for 5 minutes to thicken then pour sauce over the fried bangus, top with fried garlic. 4. Salsa: Mix all ingredients including remaining pineapple syrup. Season with salt and pepper to taste. Let stand for 10 minutes. 5. Serve fish with salsa on the side.